A while back I won a Twitter contest from Illamasqua and received the limited edition Skin Base in Au. I loved the formula but figured I should try a color that would better match me, so I ordered Skin Base in 4 from the UK. 4 is a bit darker and more color than I’m used to, so I purchased Skin Base in 1. My lovely friend Cin also sent me a sample of Skin Base in 2. This is, of course, a picture heavy post. 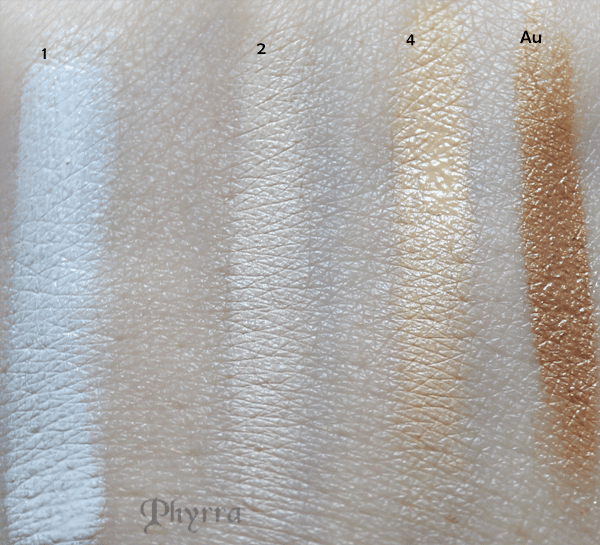 I compare Illamasqua Skin Base 1, 2, 4, Au and a 50/50 mix of 1 and 4 all together. This is taken under my daybulb light with no flash. Yes you can easily see my veins and my skin looks a bit blue. It’s just how my skin looks. This is taken with flash. 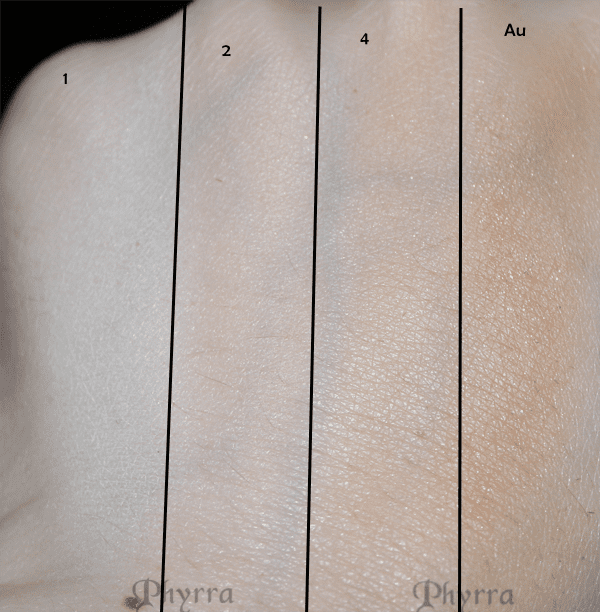 The dots on the back of my hand, while small, are extremely pigmented. I can apply 1, 2 and 4 sheerly and they will work ok with my skintone. Au makes me look like I have a tan. In retrospect, I’ve become a bit complacent about my foundation. 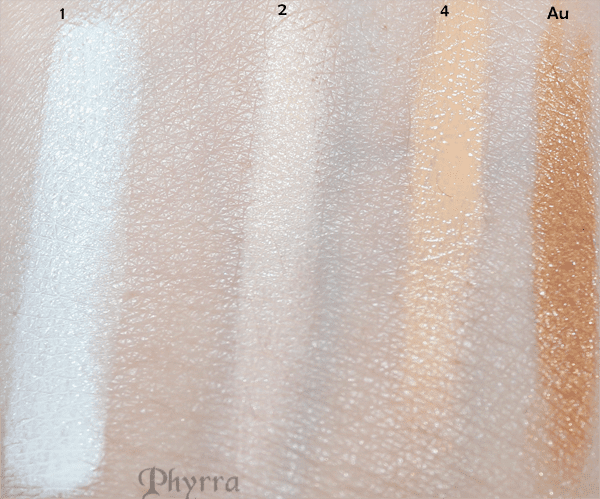 I can make most of the shades I own work for me, either by color correcting with powder or by mixing. However, it’s nice not to have to mix! This is 1, unblended. A little bit goes a long way. This is 1, blended out, covering the entire back of my hand. Remember the tiny dots from before? This is me blending them just upwards and downwards, into a more solid line of color. This is the daybulb version. This was taken with flash. These are the lines, blended in a straight line, as much as possible. This picture was taken with flash. You can see how they do sort of meld with my skin. This is taken with the daybulb, no flash. I think the Skin Base shades 1 and 2 work and can be blended out sheerly on my skintone, though as you can see 4 on its own is a bit dark for me and Au is definitely dark. 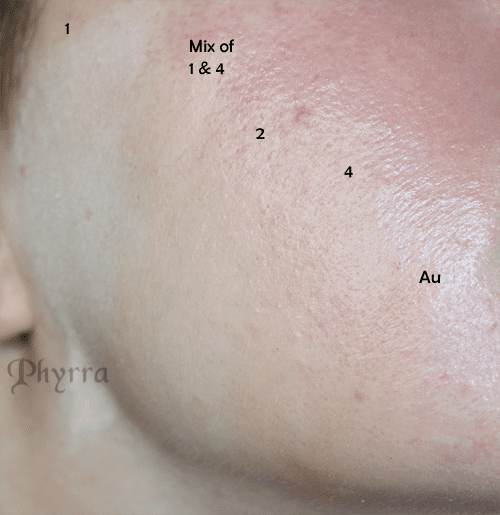 So because I thought it would be useful, I striped the Skin Base foundation along my jawline for you to check out. You can see how my cheeks have a natural pink overtone. Honestly, I was worried 2 would be too pink for me, but I think it looks pretty good. The Skin Base 1 & 4 mixture look good to me as well. In the swatch, 4 looks too dark (as is Au). I did try blending these out for you, in as straight of lines as I could manage. You can see how the Skin Base really does cover imperfections in my skin. For reference, my naked face. This is right after I’ve cleansed it and put on moisturizer. Gold is a chemical element with the symbol Au. Use to create a neutral sculpted and sunkissed complexion. Beautiful golden caramel highlight for Asian and Black Beauty tones. 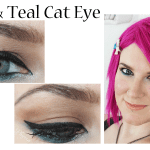 Use as an eyelid base and create a dramatic look with the Neutral Eye Shadow Palette. Based upon Skin Base Foundation 11 with added golden shimmer. Yes, I think it lives up to its claims. It’s easily blendable on my skin. It’s got buildable coverage. It’s got a wide shade range of 26 shades. 1 would make a very natural highlight on most people. It really doesn’t feel like I’m wearing makeup. It didn’t break me out or irritate my skin. The shades are very forgiving, which is why I feel like 1, 2, 4 and a mix of 1 & 4 work on my skintone when applied sheerly. When applied heavier, I think a mix of 1 & 4, and 2 would work best on my skintone. I really like the small dispenser for the product, because it allows you to get out a very small, controlled amount of product. This is ideal if you’re custom blending a shade. The colors blend together easily. I really think the pigmentation is amazing. While I prefer to apply it sheerly, you can easily build it up. I don’t tend to even conceal under my eyes when I’m using this because I feel like it gives me the right amount of color. For me, this lasts 6 hours or more on my skin. If I apply primer it easily lasts 12 hours. I also apply a finishing powder, which I think helps set the product. Because of how pigmented this is, if I have any zits or funky looking spots, after I apply the foundation, I can just dab a bit on top of the spot and this will cover it. In fact, typically the only place I ever see wear is if I’m wearing my sunglasses, as they rest on the bridge of my nose and they’ll leave a tell-tale sign. Typically I apply this with my finger tips, though I’ve used a pointed foundation brush and that’s nice, too. I think either of those methods work well, but if you’re used to using a flat top brush, you could try that and buff it in. Or you may prefer a sponge, but I haven’t yet tried that method. I do work with a section of my face at a time. 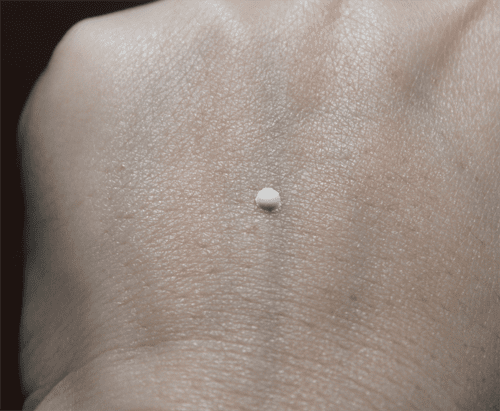 I use a small dot and apply it to my right cheek, blending it upwards and downwards, then I do my nose and chin, then my forehead, and then my left cheek. This is definitely a less is more product, so start with a small amount and work it in. Yes, since I already have purchased 2 of these, once I run out I would purchase Skin Base again. I think for a high-end foundation, this is a pretty great product. I love how it looks on my skin. I’ll likely purchase shade 2 whenever I run out of my 1 & 4 mixture, as I feel 2 is a pretty good match on me. Additionally, I think it will take me a long time to go through this foundation, since I only have to use a small amount to cover my face. Some products purchased by me. Some were gifts. All opinions are my own. Pingback: Beauty Blogs Now! 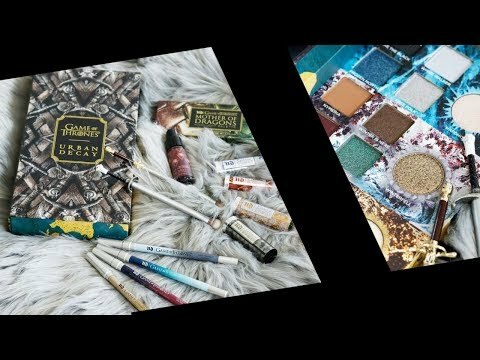 Win a Conscious Box | Beauty Blogs Now! 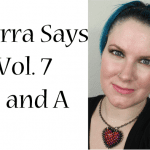 | Beauty Blogs Now! Thanks so much for this review and all the photos you’ve included with it. I have 1 on order in hopes I can use it to lighten up some of the foundations that I don’t wear since they are a tad too dark for my complexion. Now I think my next Sephora purchase might need to include 2. Ah amazing swatches and information! I’ve been interested in this foundation since pixiwoo raved about it a few months ago (although more makeup is pretty much the last thing I need). The shades really are super forgiving. I actually think the 4 works, at least I don’t notice your neck being lighter, but the 2 seems perfect! I posted on your previous post about Skin Base saying I couldn’t get it to apply right. After reading your post today I finally had another go, using a different primer (fyrinnae), applying it a lot more sheer and using my fingers. I worked! My skin looks great and it stayed matte for a really long time. Very happy! Number 2 is gorgeous on you! 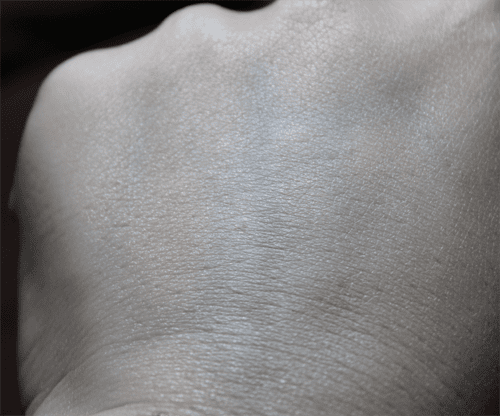 It just looks like you’ve got perfect skin – exactly what I think a foundation ought to do. I know that you don’t consider yourself dry-skinned but, do you think Skin Base would accentuate dryness? That’s my only concern before I clickity-click this into my cart! Thanks! I think you would need to prep your skin if you have dry skin. Exfoliate or use a clarisonic daily so that your skin doesn’t have dry patches and you should be fine. With the way this formula feels, I think it would cling to any dry patches and accentuate them, but if you remove them it would be ok. I think Cin has really dry skin and rosacea but doesn’t have a problem. I have hyperdry skin, and ever worsening rosacea which means there’s a lot of things I can’t use on my skin. 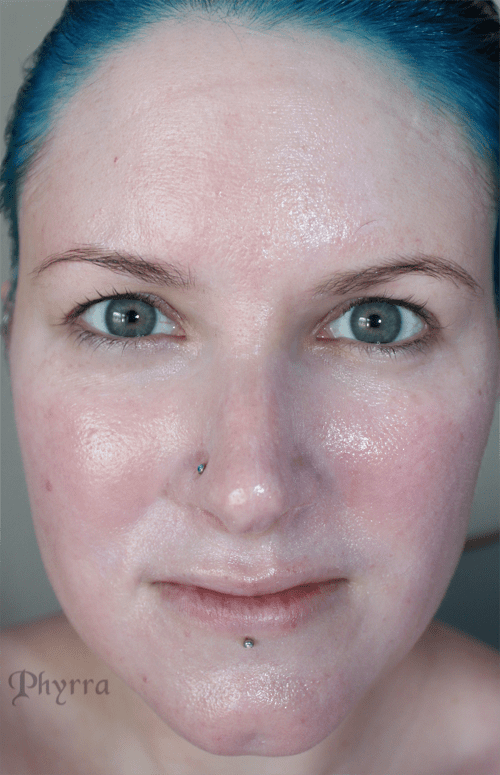 I apply my rosacea cream, a layer of either Vitamin E skin oil or “Bio Oil”, sunscreen, then primer. I apply the Skin Base with a non latex sponge, and a little goes a long way. It doesn’t make my skin any dryer. I do still need concealer on the worst rosacea spots, but the Skin Base does a great job evening everything out and making it look like skin, not a caked on mess. HTH!! See, it does claim to be inspired by the beauty balms, but then makes no claims like my Holika Holika does about being skinfood and spf etc, so it more just seems to mention it, without actually making the claims. It almost reminded me of saying something like ‘inspired by the color blue, this blue-based teal is fantastic’ or something like that. It’s a face product, it’s awesome, but it doesn’t have the multi-tasking properties I associate with a good bb cream. Fantastically informative post, great pictures. You know I can’t live without Illamasqua and recommend it whenever I can to fair skinned ladies. It’s a little on the pricey side when you have to order direct, but I’d rather spend more to get a great match than continue to try less costly brands that just don’t work. Illamasqua is having a sale right now too, 60% off for VIP members from their website. WHAT?!?!? How did I miss this!!! Headed over to stock up nao! You’ve totally sold me – I’m going to get a sample of this to test out! One question though – why did you decide to get 1 (the white), instead of getting 3, which might have matched you without mixing? I decided to get White because I knew 3 would be way too yellow. I’m pleasantly surprised that 2 isn’t too pink. I wanted to use up 4, too, instead of having it be wasted. So mixing 1 and 4 works for now. Ah, makes sense to me. Is Lipstick Queen Cruelty Free?